From Park City, Utah comes another great example of American ingenuity and entrepreneurship -- LOKSAK resealable plastic bags. Well, duh, you think -- What's new with that? Interestingly, there is indeed a place for something as apparently prosaic as a better plastic bag. 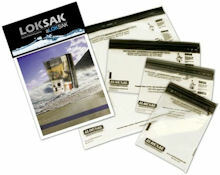 These are resealable element-proof storage bags with a patented leakproof / airtight seal. The hermetic seal keeps out water, air, dust and humidity -- so the bags are certified waterproof to 60 meters / 200 feet. The bags are tougher too, made from medical-grade film, and puncture resistant. They're temperature rated from -40F to 140F. You even can pour boiling water into the bag to rehydrate or cook food, although you can't place it into boiling water. As a result, you can use the LOKSAK bags for better kitchen storage, to keep food fresher, or to hold ice or moist wipes. Plus they're also great to keep water and dust out -- for hikers or riders, or simply for a family day at the beach where you need to protect wallets and documents. And, of course, the most interesting usage is to protect our electronic devices, from your phone out in the rain to your tablet with the kids in the kitchen. You can use these as normal through the bag, including working on the touchscreen. The aLOKSAK bags are available in sizes from 3 x 6 to 32 x 16 inches, starting at $7.59 for a three-pack. The TSA 9 x 6 in. three-pack is $9.49. 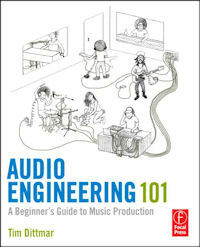 Audio Engineering 101: A Beginners Guide to Audio Production, by Tim Dittmar is a really great book, both for novices interested in getting into audio work, and for enthusiasts who want to do a better job editing audio with video. Dittmar covers the technology of audio engineering with clear explanations and friendly illustrations, and also spends significant time on the business and practice of being an independent producer, sharing his knowledge and skills as a teacher and from his more than twenty years as a professional sound engineer, producer, songwriter, and musician. The book starts with the basics of sound and how the ear works, and then immediately turns practical with advice on how to listen to music, with ear training tools and techniques, including sample audio and video clips provided on the companion website. Another chapter on the details of equalization and frequencies is then followed by advice on people skills, including tips on how to handle yourself when working with sometimes difficult clients in the recording studio. Dittmar is particularly good at describing the lingo used in the field and in the studio, to help you better communicate how the sound may be a bit too muddy or fuzzy or shiny or wet. The middle of the book then is filled with practical advice on microphones, mixing consoles, and signal processors, including extensive details on specific equipment and numerous tips on solving problems, like using a chorus effect to help out-of-tune vocals. Dittmar then brings these elements together in a wonderful pair of chapters -- one on signal flow, working through typical end-to-end recording scenarios, particularly for laptop recording, and then the second on studio recording sessions, full of practical advice on planning and executing a full recording session, including lists of tasks and sage advice on details of each step in the process. The book then takes a step back, delving into the basics of acoustics, and the impact of science on making your recordings sound better, including ingenious do it yourself projects for making diffusers and baffles. There's also a section with perspective from the history of audio, including recognition of the contributions of Les Paul and others, and considerations of analog vs. digital sound. If you've gotten this far, you might be serious about getting into audio production, so Dittmar concludes with three chapters of practical advice: on taking advantage of internships (including a tip on how to roll up a mic cable so you look professional); different types of jobs in the field, including starting your own home studio; and a final chapter of frequently asked questions on gear, skills, and the industry, with answers from a variety of working pros. This is a fun, friendly book that reads like the warm-hearted audio master passing on his wisdom to a favored pupil -- with not just the facts, but the practical advice from long experience. It's worth listening. Power is still the weak point of our engagement with portable devices. It's great to be constantly checking e-mail, browsing the web, playing music, and watching streaming video -- but not so great when the baterry runs down before the end of the day. Plus, today's devices require more power -- Smartphones like the iPhone use more than the smaller iPod media players, and the iPad and other tablets require more amps to recharge (stronger electrical charge), which result in larger external batteries. To meet this need, and more, Mophie has extended its line of portable batteries with the new Mophie Juice Pack Powerstation Duo, which not only packs power for larger devices (6000 mAh, output up to 2.1 amps), but also features dual USB ports so you can charge two devices simultaneously. It's best to charge a tablet like the iPad by itself, but you can charge two smartphones like the iPhone at the same time. Use the LED power level indicators to check the battery status as you charge. The Powerstation Duo also has a microUSB port to recharge the internal battery, from a computer or an iPhone / iPad or compatible wall charger. All this comes in a relatively small and lightweight package (around 4.3 x 2.3 x 0.8 in. and 1 lb.). The design also is nicely understated, with black soft-touch top and bottom surfaces and a stainless steel outer band. The Mophie Juice Pack Powerstation Duo is available for around $99. The Juice Pack line also includes more compact models, for tablets and for smartphones, including a rugged version and several designs with built-in Apple connectors. Noise-reduction headphones are now a common sight on airplanes, to reduce the stress from hours of droning noise from the engines and air systems. And noise reduction is not just for flying tubes -- it's also helpful in environments like offices or bookstores that still have irritating ambient noise from rustling people and the heating / cooling systems. But while you need strong noise reduction for hostile environments, it can be too much for quieter situations. After all, active noise reduction works by canceling out the incoming sound by generating a signal that is its inverse. So you can feel the ear pressure from heavy processing in quieter environments. Previous generation products like the Audio-Technica ATH-ANC7 QuietPoint Headphones offered active noise reduction up to 85%, with reduction up to 20 dB, which worked well as a balance between handling very strong and quieter background noise (see earlier post). The new Audio-Technica ATH-ANC9 QuietPoint Headphones significantly enhances the the noise reduction to 95%, which might seem to be overkill for environments other than airplanes. Plus they also work in passive mode, with noise reduction turned off (i.e., even without the AAA battery installed). For very long trips, the noise reduction will run up to 35 hours with a lithium battery. The ANC9 headphones include two different detachable cables, one with an inline omnidirectional microphone and controller for answering calls and controlling music. The solid carrying case also includes an airline adapter and stereo adapter. They are designed with large earcups that surround your entire ear, with memory foam padding on the earcups and the headband. But the headphones still fold flat for travel, and weigh in at about 7.8 oz. The headphones feature 40mm drivers for high fidelity. The sound is somewhat muted compared to other headphones, especially in passive mode, so you may want to adjust the volume accordingly. 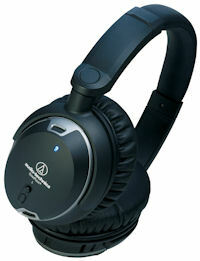 The Audio-Technica ANC9 QuietPoint Headphones are priced at $349, and are available for around $265 (street price). Wireless speakers are great fun -- They bring your music out from your smartphone (or tablet, or laptop), so you can enjoy and share the fuller sound. But there's always a trade-off between larger (and more expensive) units for bigger and better sound, and staying small enough to be reasonably portable. The HMDX Jam portable speaker fits nicely in a sweet spot, providing strong sound in a reasonably small package, about 2 1/2 inches in each dimension. At 9 1/2 ounces, the Jam won't travel in your pocket, but fits nicely in a bag or luggage. It runs up to 4 hours wireless over Bluetooth, or 12 hours wired though the line in connection, and recharges through a microUSB connector. Plus it's cute -- The jam theme is carried by the tapered cylindrical design, and by the packaging -- a plastic jam jar with screw-on lid. And the Jam comes in delicious "flavors" -- apple (green), apricot (orange), blackberry (grey), blueberry (blue), grape (purple), and strawberry (red) -- and even include a whiff of the associated scent in the packaging. Oddly, the Jam plays irritatingly loud noises for power on (3 tones), and for Bluetooth connect / disconnect (beeps) -- and these apparently cannot be quieted or disabled. But once it's set up, the Jam sweetly pumps out quite loud and good sound from a relatively portable package. They're available in your favorite flavor for around $40. Entries posted to Manifest Tech Blog in July 2012, listed from oldest to newest.